Sitting with a dear friend this week having wonderfully deep discussions interspersed with deviously inappropriate and tasteless conversation often yields some really inspiring content and lots of laughs. This week we began discussing the impulse human beings have to be right. There are various reasons people feel the need to "be right", and some personalities are more prone to defend their rightness than others. Whatever the case, you can be sure that all egos want to be right, and in that pursuit someone must be wrong. So what is it in us that needs to be right as opposed to being peaceful. Relationships have ended, feelings hurt, lives have been lost and nations tumbled over the need to prove somebodies version of rightness. The ego needs to make itself right and others wrong in order to justify its existence. We come to believe that if we are wrong we are not worthy. Eckhart Tolle in The Power of Now has a wonderful explanation of this phenomena. We don't stop there. Often we feel we must find others who agree so we don't feel "crazy". Some people find solace in the ideological support of a religion, philosophy, science, political organization or community. Whatever the case we need someone to affirm our rightness because on some level, we need to believe a.) that someone somewhere is just like us and b.) that the rightness of our being is not enough, we need the egoic extras. When we enter into the need to be right we have, to utilize Byron Katie's language, entered a war zone. We are not only at war with other people but we enter a war with ourselves. The main casualty is peace. The collateral damage are our relationships and ability to listen. 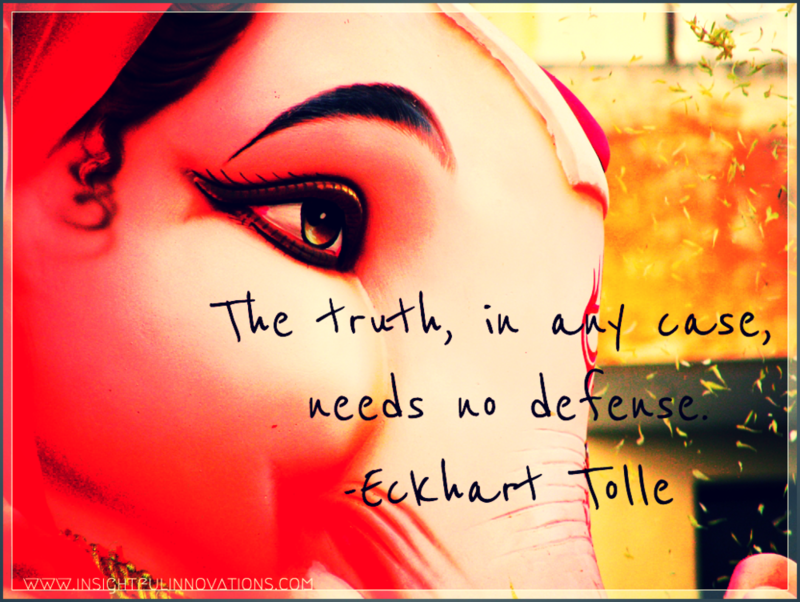 Truth needs no explanation or defense, it swells from a deeper, wider part of our being. It may be threatening to others because it is not their truth, but real Truth needs no justification because it emanates from love and perspective. In this sense the only thing that is right is what appears in any given moment. And at the moment when someone doesn't accept your truth or what you say is right, that is exactly what is right. Does this mean you don't speak your mind or express your opinion? No. It means that you do so without attachment to whether other people believe or accept what you say is The Truth. We can only bring our perspective, which stems from a variety of variables. This also means recognizing that you are not lessened by their disagreement or disbelief. You could be telling them what you believe is an unequivocal truth about reality, but the Reality of the situation is that, at that moment, that is not their truth, and as painful, destructive, shortsighted, inconsiderate, misinformed or disturbing their current truth may be, they're allowed their truth just as you're allowed yours. Next time you feel the impulse to prove your rightness, take a moment. Say nothing, or simply say "okay." This will be more uncomfortable for some people than others. The discomfort at breaking the ego's defense pattern will loosen the ego's identification with its toys (in this case, the idea of rightness). In the long run it creates greater openness in our relationships with others because when we're not thinking about how right we are, we find that we can actually begin to listen to the other person, and may even find the we may not have been all the right to begin with...or maybe we'll reaffirm our rightness. Either way, the shift is internal. Sometimes we need to correct an obvious mistake, but if we do it without ego it is not defending our rightness but simply a statement of fact. Like Eckhart Tolle's example: if someone says the world is flat, and you know it's round you can simply say, it is flat. That's not ego, but a statement of a consensual accepted reality (but not necessarily ultimate Truth, just an accepted interpretation). If the person disagrees you can simply know that it is round, and perhaps entertain that it is flat in their experience. You then could be up for one hell of an interesting conversation if you're willing to listen to their perspective. Sometimes we choose to pursue "rightness" because something offends our higher values as a human being. We may then launch into a noble cause to uphold that sense of rightness. Many atrocities in history have been exposed and reformed through upholding a higher standard of rightness. In this instance the rightness that is sought is of a higher ethical order, and in those moments when the sanctity of life is being threatened it may be appropriate for some to choose to embark on the war to be right. But even those who fought in the trenches for the higher values of humanity note that it still feels like war, and ultimately taxes one's emotional and physical health. In all situations we can choose to be right (which may be the right choice) or we can choose peace. Knowing when to choose what requires presence and perspective, which can only come through the recognition of our habitual limiting egoic patterns.